Employees of Lancaster P. Lupton built a trading post on the creek near here in 1841 to trade with the Sioux Indians. From 1842 until at least 1845 this post was managed by Louis B. Chartran, first for Sibille and Adams and later for Pratte & Cabanne. These companies were successively headquartered at Fort Platte about eighty-five miles southwest of here and competed aggressively with Pierre Chouteau Jr. & Co., which owned Fort Laramie. As a result of this competition, fur traders were very active in this region during the 1840's, bringing liquor, blankets, guns, ammunition and other trade goods to exchange for fine Indian-tanned buffalo robes. This creek is shown on the earlier maps of the area as "Chartran's Creek" in tribute to the trader Louis Chartran. The French settlers of Missouri Pronounced it "Shattron," and from this the modern name of "Chadron" evolved. Today this creek is Chadron Creek, and from the creek the city of Chadron received its name. 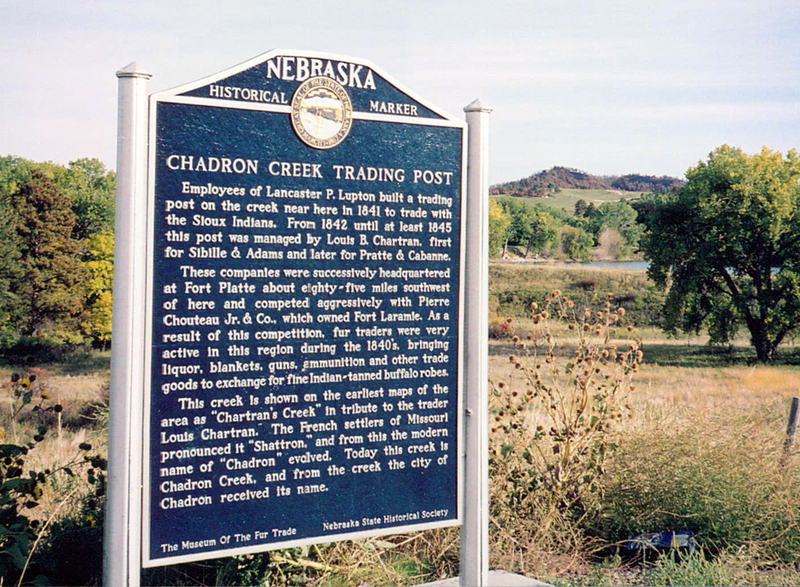 “Chadron Creek Trading Post,” Explore Nebraska History, accessed April 18, 2019, https://mynehistory.com/items/show/115.